Camper Vans: a Blessing or a Curse? Over New Year I went to Siurana in northern Spain. It wasn’t the best trip. Just before flying out Stu caught flu, and I got it soon after. The first few days of the holiday were spent holed up in our room in the refugio. What made it worse was that the heating was broken so we had to lie fully clothed in bed sharing one sleeping bag between us. Hanging out in our flu pit trying to get well. Things improved after a few days and we made it out climbing, but neither of us felt our best. We had to pick crags with short walk-ins, and only managed easy routes most of the time. Not quite what all the training had been for! Despite the grimness, it was great to be back in Catalunya. I do love it there. The people, the language, the climbing and the sunshine make it a really special place. This is how I had imagined the holiday. 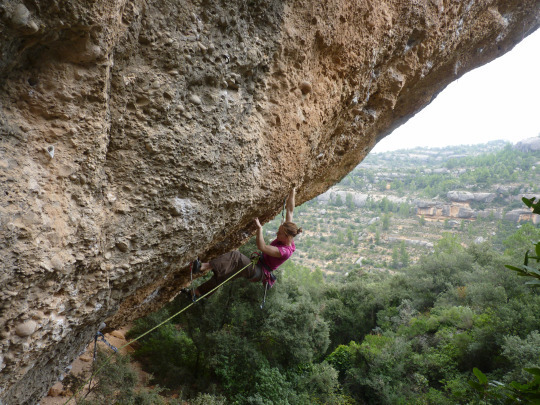 Magic Festival, 7c, Margalef (taken a few years ago). I have been to Siurana a lot over the years as I used to live in Barcelona. One thing that really struck me this visit was how many vans there were. There were literally hundreds. As a van owner myself, it got me thinking about our responsibilities and how we should behave. All too often, it seems that finding a convenient van spot takes priority over preserving the natural environment. In Saint Leger last autumn I was quite shocked by just how much waste matter and toilet paper there was littering the ground near the preferred van spot when there was a perfectly good public toilet just a few minutes up the road. 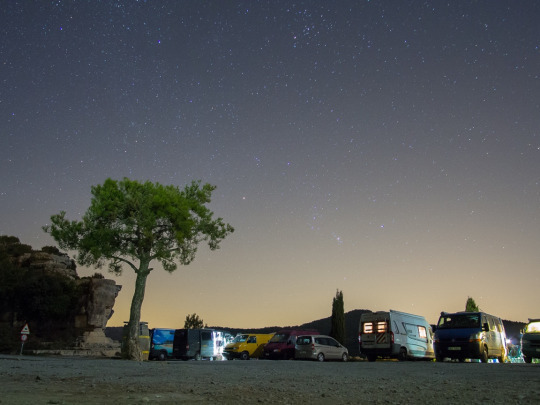 This new year there were huge numbers of people van camping right next to Siurana village and in the central car park in Cornudella de Montsant. It certainly gave the area a much more run-down feel, and I worry about what this is like for the people living there. 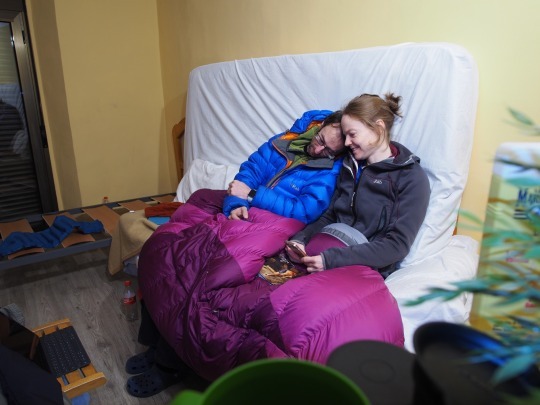 Do they mind the hordes of climbers cooking in the street and sleeping on their doorsteps? I honestly don’t know the answer to this. It is undoubtedly true that climbers help boost the local economy by buying food and coffee from the local establishments. But is this enough to make their presence something that is appreciated? On my last trip to Chulilla I was amazed at the number of climbers in the area. The village was teeming with people in down jackets carrying rucksacks. Local refugio owner Pedro Pons told me, however, that the villagers welcomed the climbers and were very happy to have their business. This was something I was pleased to hear. In Margalef things are not quite so harmonious. The situation reached crisis point a few years ago, and, as a result, designated van camping spots were developed with basic facilities. Now you must pay a small fee to stay there, and if you camp anywhere else in the area you may be slapped with a hefty fine. The situation is clearly not popular with many and I believe this explains the large number of people staying in the Siurana area where there is still no charge to park up. However, I think it is a very sensible approach for areas with a high numbers of van campers. It strikes a balance between the desires of van owners and the needs of the local area and people, and it solves the important issue of toilets which should surely be of primary concern to all. Van life is an incredible thing. It gives you the freedom to go wherever you like, whenever you like, and to camp in some of the most beautiful places on earth. I strongly feel, however, that we should not take this privilege for granted. We should minimize our impact by using public facilities wherever possible, taking all litter (including toilet paper) home with us and by being respectful to the local people by not parking up in areas where there is a chance that our presence may not be welcome. One of my favourite van spots near Orpierre, France. We’ve just been on our first trip abroad in our van. We spent two weeks travelling around Provence, and I loved it! We have a Citroen Berlingo with a Boot Jump from Amdro and it is seriously good. The boot jump kit seems to make space out of nowhere and the bed and sofa set-up are both really comfy. 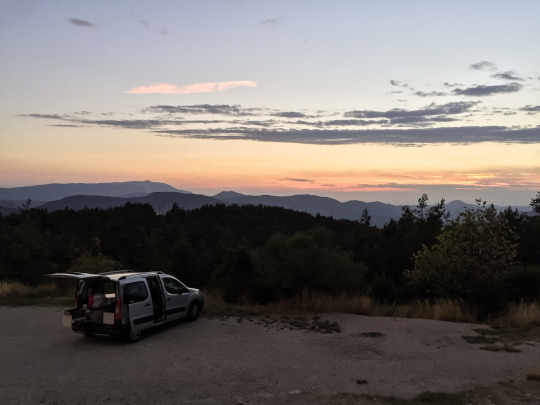 We stayed in some stunning locations both at Saint Leger and Orpierre, and it was lovely waking up each morning to beautiful views and cooking out under the stars. 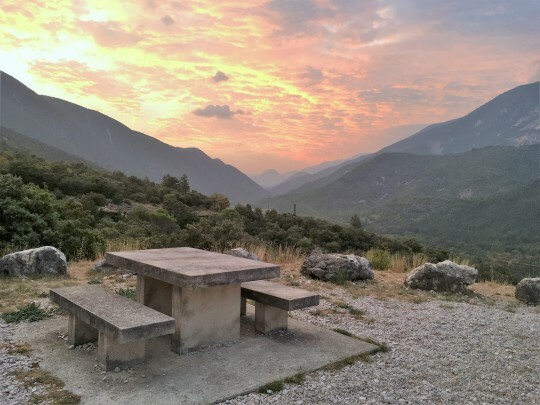 In Briançon we opted for the luxury of a campsite, which was also nice for a few days. Our van spot in Orpierre. The best bit about a van for me is the complete freedom. We moved around from Saint Leger to Briançon and Orpierre and then back again, deciding on a day-by-day basis where to go. The best bit about the trip from a climbing perspective was trying so many different routes of different styles. There is just so much rock in France! One thing I hadn’t anticipated was how much trouble I’d have with my head post-injury. 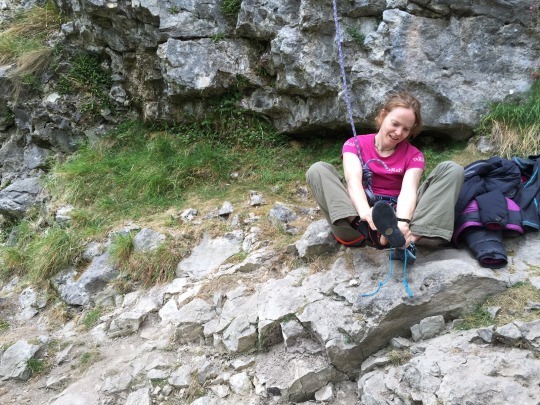 I’m only just back climbing on lead again after hurting my ankle in May, and it wasn’t until the end of the trip that I started to feel confident again. I had a lot of frustrating days where I felt good on the moves but I couldn’t lead between the bolts without being gripped with fear. Trying Du Miel Entre Tes Seins, 7b+, St Leger. I got really scared on this! I fell off a lot this holiday! Onsighting is definitely a low percentage game. I fell off 6cs and 8as and everything in between. But I did also manage to onsight a 7c/+ at Rue des Masques in Briancon which was my hardest onsight to date, and made me really happy after all the trouble I’d had with my foot. Trying La Fruite en Avant, 7c, St Leger. No joy on this one. 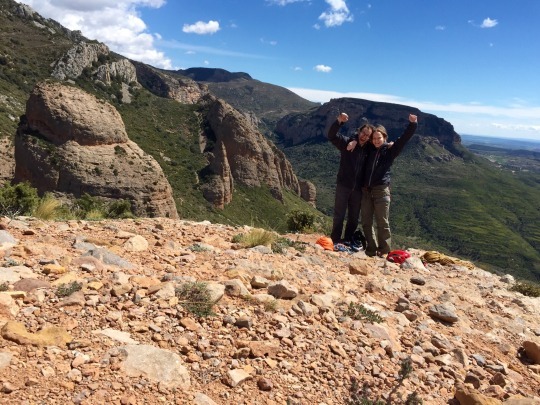 This trip was the perfect balance of relaxing holiday and climbing. Saint Leger is a fantastic holiday location with beautiful views, a river to swim in and the best bakery in the world (let me know if you want directions!). I can’t wait to go back! Back in May I hurt my leg. I fell off climbing indoors and hit a hold on the way down. At first I was pretty sure I had broken it, but thankfully the x ray was clear. What I did have was a severe ligament tear. For the first week I could hardly weight-bear, and resorted to hobbling around with some walking poles as crutches. I was told it would take 8 – 12 weeks to fully heal and so most of my summer climbing plans had to be shelved. Having never been seriously injured before, I wasn’t sure what to expect. Actually, it’s been pretty good. A foot is good thing to injure as a climber because you can still train pretty hard on the fingerboard. 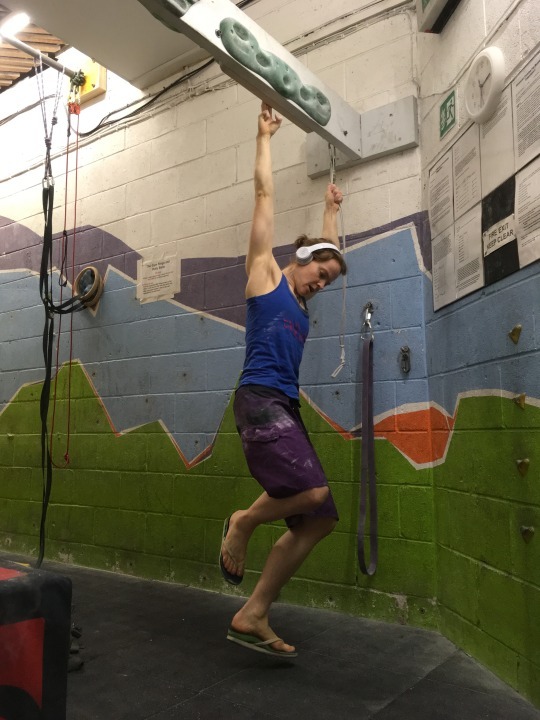 My coach wrote me a brilliant training plan based on upper body work, which I started as soon as I could hobble down the wall. It’s amazing how beasted you can get without actually climbing! I’ve also been hammering the physio work and slowly building up to cycling and running again. It’s taken a while, but I’ve quite enjoyed working out the best ways to rehab my foot (vitamin C and wobble cushions apparently!). First day back climbing. Still couldn’t get a normal rock boot on at this point so I had to borrow one several sizes too big. The thing I’ve missed most is being outdoors. For over a month I couldn’t walk on uneven ground so I was confined to the city. I really missed being in the countryside, breathing the fresh air and seeing the crags. I was also disappointed not to be able to take part in the British Bouldering Championships a few weeks ago. I had been training really hard for it previously, but unfortunately my foot didn’t feel up to it and it was not to be. Two weeks ago I began climbing properly again on lead. 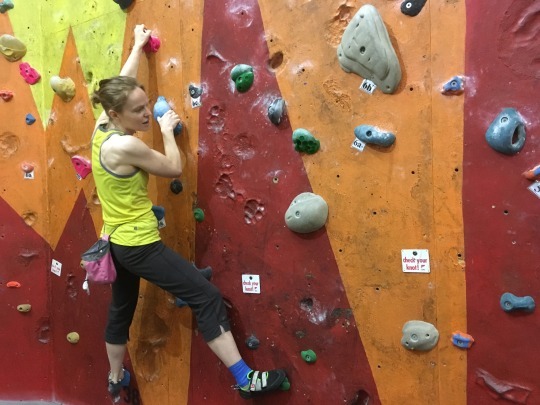 I still feel very nervous in case I fall badly and re-injure my ankle and I think it will take a few weeks to get my confidence back, but it’s great to be climbing again. At the moment I am mostly sticking to the steep stuff as my ankle still feels weak, but luckily I have a lot of projects at Kilnsey so there’s plenty to keep me busy! First day back at the crag! Top roping only, but it was great to be out. What to say about last weekend? Probably the best climbing weekend of my life. 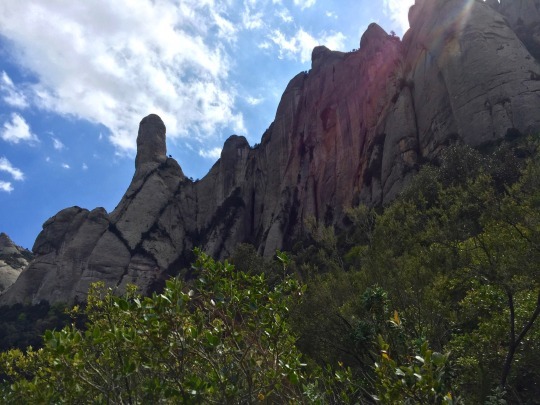 Last Christmas, Stu and I hatched a plan to come to Spain for a long weekend in spring and climb two of the great classic multi-pitch routes: la Punsola Reniu in Montserrat and Fiesta de los Biceps in Riglos. Last weekend we finally managed it. La Punsola Reniu goes up the front face of this amazing pinnacle. I found both routes challenging in different ways. La Punsola is very run out on the easier lower pitches on rock that is blind and impossible to read. My first pitch had only 5 bolts in 50m! Fiesta was steep, burly and very committing. Abseiling down rock of that angle would be almost impossible so the only way was up. There were so many incredible moments over the weekend and it’s impossible to put it all into words. 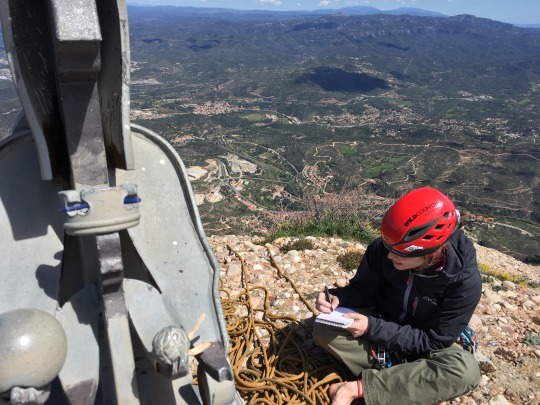 Summiting on top of the Punsola pinnacle and signing the route book hidden in the statue on top, belaying stood on a massive potato after the last hard pitch of Fiesta knowing that we had done it and having celebratory ice creams sat on the terrace of the Riglos bar all stand out. It was an unforgettable weekend that will be hard to beat. Signing the book on the summit of the Punsola. And how do you celebrate completing “the double” Littlefair-style? Double McDonalds of course! Tired, but very happy, on the summit of Fiesta. 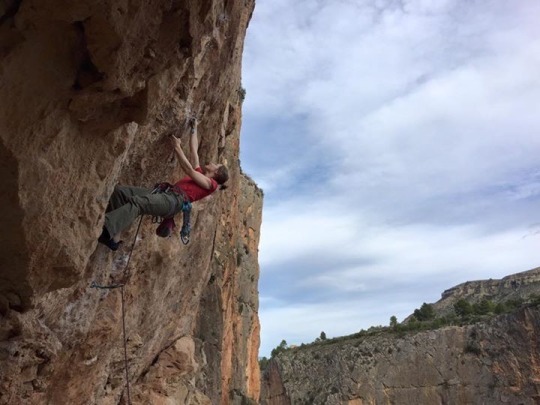 I just got back from a week in Chulilla where I enjoyed great company, perfect climbing conditions and a welcome break from work and everyday life. We stayed at the refugio owned by Pedro Pons and his wife, which is perched on the edge of the gorge just on the outskirts of the village. 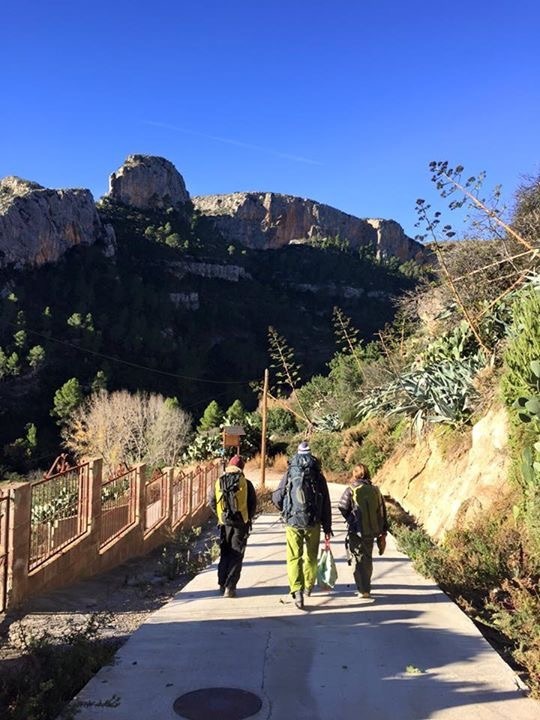 Not only was this one of the nicest climbing refugios I’ve ever been to, set in a stunning location with comfy rooms and good Wi-Fi, but it was amazing to meet and chat with the Spanish climbing legend himself. Pedro is a great inspiration to me having dominated both on rock and in competition, and I was made up to finally meet him in person. 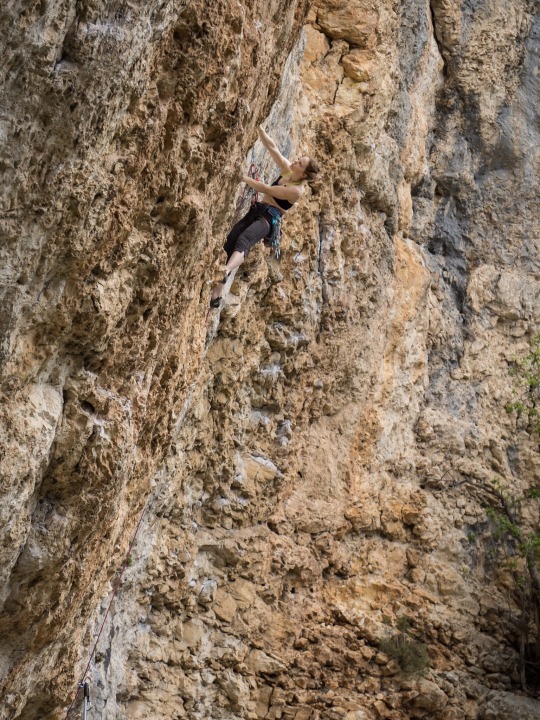 Onsighting is one of my favourite forms of climbing, and Chulilla is brilliant for this. There are so many routes to go at in the 6s and 7s that when you clip the chains or fall you can just pull the rope and move on to the next one. I did so many brilliant routes during the week it would be hard to mention them all, but the standout has to be a 7c I did on the last day. Tufa climbs are all about weird body positions and trusting your feet on smeary holds, and these two things usually make me panic. Pedro suggested a 55m long tufa 7c to me and I was doubtful at first, but then the line looked so amazing I thought I might regret not having a go. It was the most epic, intense experience I have ever had on a sport route. 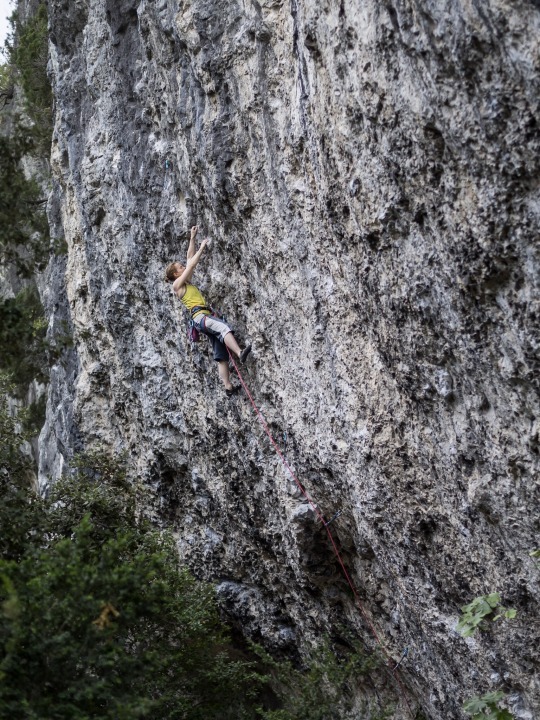 The route takes a line up two almost vertical, smooth, featureless tufa pipes to a chain 55m up in the sky. I was never pumped, but my body was so tired from pushing and bridging that it felt like mental torture the whole way up. Most of the time I just wanted it to be over so the pain would stop, and yet I didn’t want it to end at the same time. It was like a weird puzzle of odd, off-balance moves that no amount of training could prepare you for. It took me an hour and a half to figure out a way to the chains, and I am really grateful to Karl for belaying and Keith for hanging around at a cold crag all that time. It was a brilliant route, and one of the most amazing pieces of rock I have ever climbed. I never would have got on it without the recommendation so thanks Pedro! It definitely made my trip. I was really sad to come home after such a great week clipping bolts, soaking up the sun and speaking Spanish. 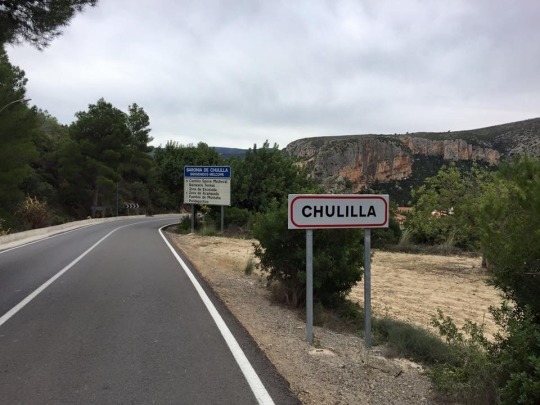 Chulilla is a beautiful place and I’d definitely recommend it (and the Altico refugio) to anyone looking for somewhere new to go.